it makes sense to not ride a big, low-slung cruiser. But SOPAN JOSHI isn’t given to good sense! “Where are you thinking of taking it?” asked the friendly Monish Nangrani of Harley-Davidson (H-D), handing over the Heritage Softail Classic. “Kumaon,” I said. “Why not Rajasthan?” he suggested, “It won’t rain that much and the roads are straighter.” He was thinking of my best interests—as also the difficulties of recovering the motorcycle from the hills in case I pranged it. I had already chosen my means of transport: H-D’s Softail motorcycles are comfortable cruisers designed for the highways of the vast American expanse. My past experience with such cruisers had been unsatisfactory and it was time to redeem this relationship. The mountains of Kumaon, though, do not provide the ideal location for such redemption. Low and heavy cruiser-type motorcycles with slick tyres are made for eating up the miles on smooth road. They do not lend themselves to the twisting hill roads, which demand agile and light machines. Especially when the monsoon was venting orographic precipitation in full fury. Rajasthan, like Mohish suggested, is ideal country for cruisers. But then H-D’s cruisers use air-cooled engines that heat up like boiler rooms. Combined with the heat of Rajasthan, this can produce volcanic results. Having roasted the inside of my legs on H-Ds in the past, I was only going to take the Softail somewhere cool, like the mountains of Kumaon. Delhi was unmolested by the monsoon when I headed out early one July morning (along with a college-going nephew who insisted I needed an attorney on the road trip; it is a gonzo phase). 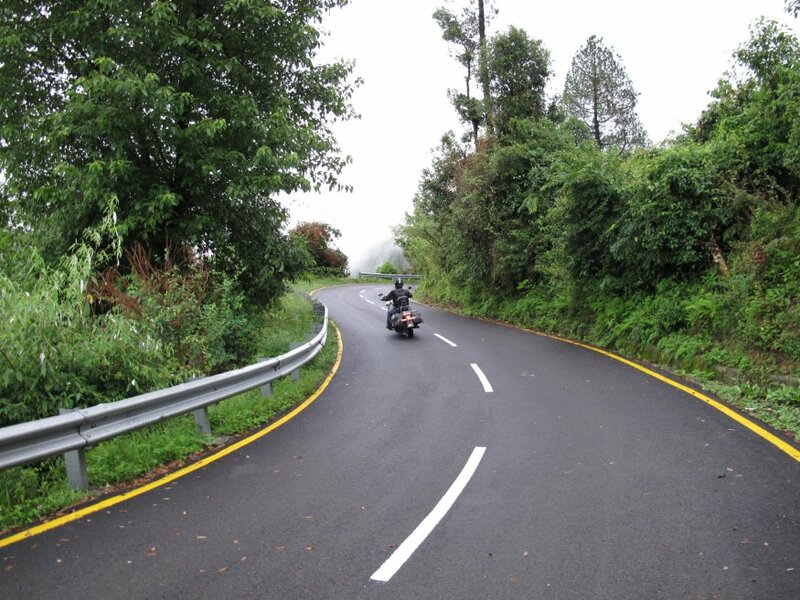 On the relatively smooth National Highway 24, the motorcycle was in its element. With about 1,700 cu cm of engine displacement, the Softail does not lack for power. Overtaking vehicles is a pleasure; knowing that you are the fastest thing on the road is quite reassuring, as much for road confidence as for self-esteem. The windshield adds to the comfort, cutting out the drag one feels at high speeds. Going through the towns along the highway, though, proved tricky. The cruiser has a relaxed riding position with the legs sprawling all the way forward. Stopping and paddling through traffic is a bit of a pain, given the weight of the beast: 341 kg. That, along with the low riding position, provides the sturdiness and stability that is a Harley-Davidson hallmark. This also means the Softail steers like a mid-sized ship and has a turning radius of a truck. It took me a little while to get used to the bulk. I couldn’t adjust to the attention of passers-by, though. We stopped at Gajraula for breakfast and people just gathered around, taking selfies next to the bike, asking questions about the price and engine capacity (I said I don’t know the price because I had only just stolen the motorcycle and was running away from Delhi with it). This was when the rains arrived. We had raincoats and our stuff was tucked into waterproof saddlebags. Yet, as soon as we set off from Gajraula, I was struck by fear—the rain was coming down in sheets. I had visions of failing to drag the metal-monster out of water-logged roads. This is when the attorney advised me to just ride. After years of riding in the rain, motorcyclists in India figure out that rainfall is patchy. Keep riding and you will soon get out of the rain. It was smooth sailing all the way to Rampur and beyond. As the foothills approached, the weather turned pleasant, and the roads tricky. A friend who works in Sitla, about 40 km above Bhowali, was supposed to meet us; he called and said he was stuck in Nainital due to heavy rains. We were surprised, for Bhowali was dry, though overcast. Were we lucky or was he exaggerating? Due to a mix-up he had let go of his taxi some way above Bhowali. Now there were three of us and one motorcycle, with little possibility of finding public transport. 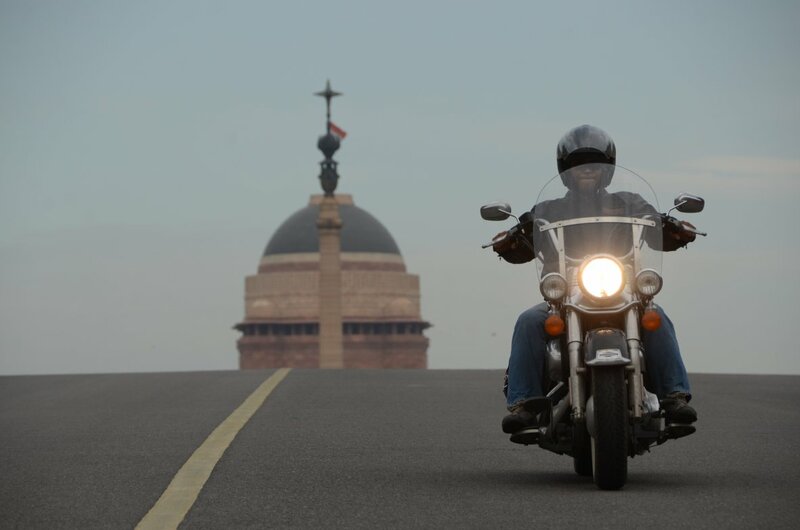 Though large, the Softail has stepped seats; the pillion sits a few inches above the rider. This means it cannot seat three people comfortably. Definitely not when one, the attorney, is 6’3”. How hard can it be, I said to myself, asking my friend to hop on. It was terrible. The backrest behind the pillion meant there was no room to stretch at the back. So I was getting pushed on to the fuel tank. The handlebars are designed for a laid-back posture; getting pushed ahead meant my arms and hands were exerting too much pressure on the handles, making them ache. And then there were the mountain roads. I rode for about 20 km in such extreme comfort, till my friend manage to get a ride. In the acute distress of riding triple, I had failed to notice that the motorcycle was going around corners quite beautifully. 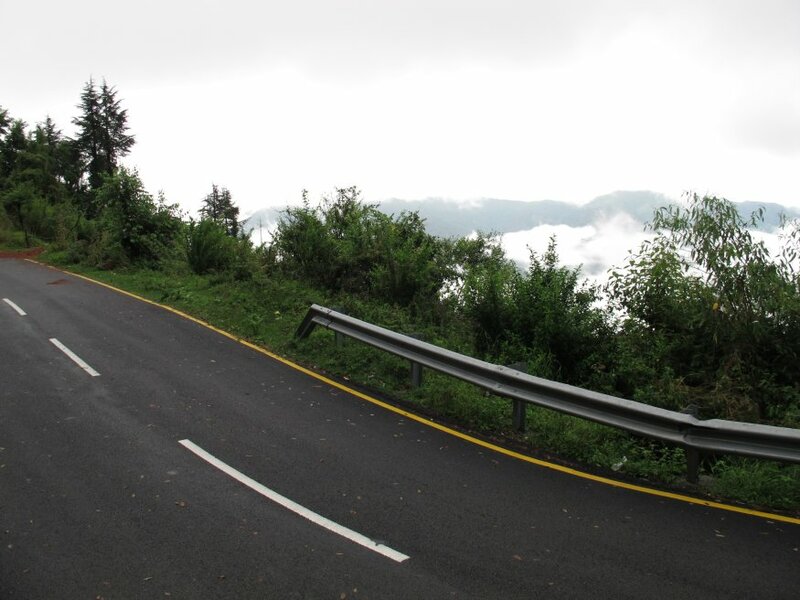 The Bhowali-Mukeshwar road is very good and goes through forests. With hardly any traffic on firm tarmac, I had started going faster around the bends. After offloading my friend, I began leaning into the corners. For all its bulk—and I must admit the footpegs scraped the road repeatedly—the Softail has lovely balance. It’s possible to rapidly lean side to side. There is nothing extraordinarily about leaning into a corner. 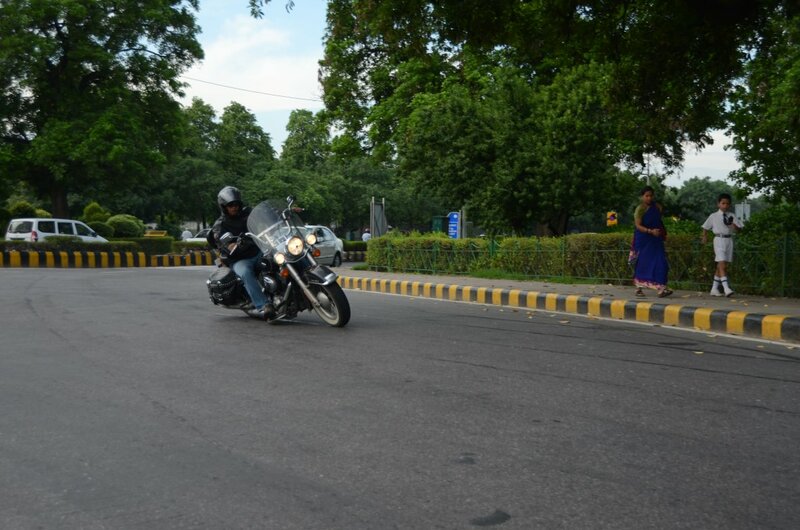 But going fast on twisting roads requires an upright, alert riding position. To do it sprawled out supine on a cruiser is a special feeling, and it releases extra adrenaline. (It’s like Monster Truck Racing. Or using a heavy bomber like it’s a fighter jet.) And then there was the scenery, with the clouds coming low, the hills covered in verdant apparel and the vista changing dramatically every few corners. Before we knew it, we had reached Sitla. My friend’s house was a long way down a dirt track paved with loose stones in patches. It was not possible to leave the motorcycle on the road, so I rode it down the track. Great as they are on the road, slick tyres are nightmare on wet, pebbly surfaces, especially downhill. Then there was the turning radius that required a football pitch. After many skids and heart-stopping moments, the motorcycle and I reached the end of the track and parked there. We stayed with my friend and I caught up with him after a long time. I was intending to leave the next day, perhaps to Mukteshwar or wherever that lovely, smooth road with panoramic views would take me. But the next day the monsoon hit Sitla with great fury. The rains made it impossible to step out, let alone attempt to ride. I read, chatted and admired the views from the hillside house. We were determined to leave early the next morning, come rain or sunshine. Luckily, there was hardly any rain. I managed to ride up the dirt track—going uphill with little traction is easier than going downhill—and we set off. The valleys below were covered in clouds that occasionally strayed up and covered the road, too. We rode through the mist, turning around the corner into a cloud. The Softail did its job without complain. 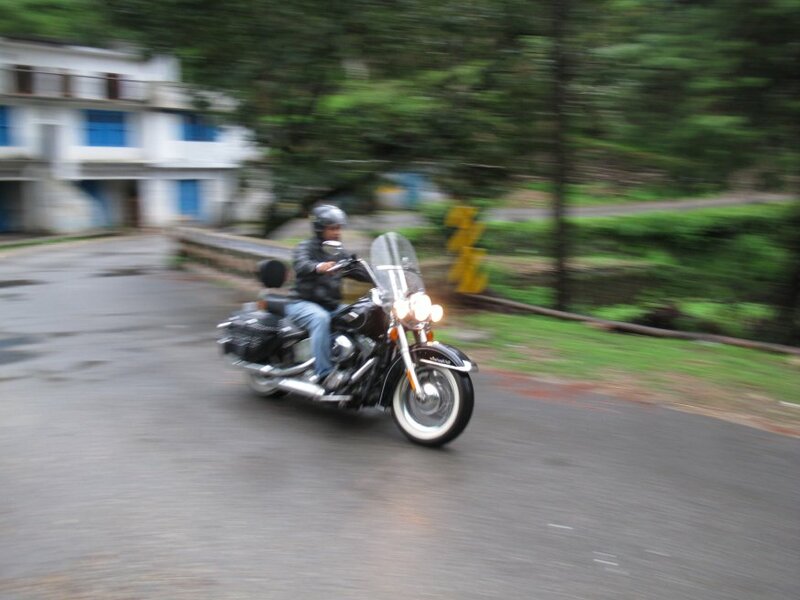 It was a perfect ride, the sort you remember and share with other motorcyclists. And then we hit Bhowali, or lets say a storm cloud hit us. It pelted down so hard that visibility dropped. The windshield, which had served me so well on the ride up, now made things worse; unlike in a car, the motorcycle version does not have a wiper. This made it even more difficult to discern the road ahead. There were trucks and cars all over, and I was riding a motorcycle that wasn’t built for manoeuvrability. I pulled up at a dhaba for tea to wait out the rain. Half an hour later, the rain had intensified. I was also getting panicked phone calls from home, because TV news channels had shown footage of a motorcyclist getting washed out in a deluge in the foothills nearby. I faced one of those moments that make you question what you are all about. Was I going to let the downpour get the better of me and my cruiser ride? Those who ride motorcycles for pleasure are people who err on the side of courage. I set off in the downpour. Each corner, each stream flowing on to the road was a challenge that could be met only with concentration and alertness. I had rolled up a jumper and put it over my seat to gain height and see above the windshield. As I ran into sheets of rain, I was actually shouting at the rain god, “Is this all you’ve got, eh?” In my head played Richard Wagner’s ‘Ride of the Valkyries’, which captures in music the carriage of fallen warriors to the Valhalla. We rode through several downpours before hitting Rampur in the plains, where the sun shined on the highway. Riding at high speed dries out your clothes real fast, and we were largely dry when another rainstorm hit us. There was so much water on the road that just the splash from passing vehicles was enough to drench us, had the rains relented. But the rains did not relent until we reached Gajraula. The home stretch dried us out before we reached Delhi. A friend, also a motorcyclist, came to see me soon after. He saw the little ship on two wheels and let out a cry, “You mad man! You went to Kumaon on this? In the rain?” I smiled, nodded, and patted the Harley-Davidson Softail on the seat with affection. When you go through hardship together, you forge a special bond. 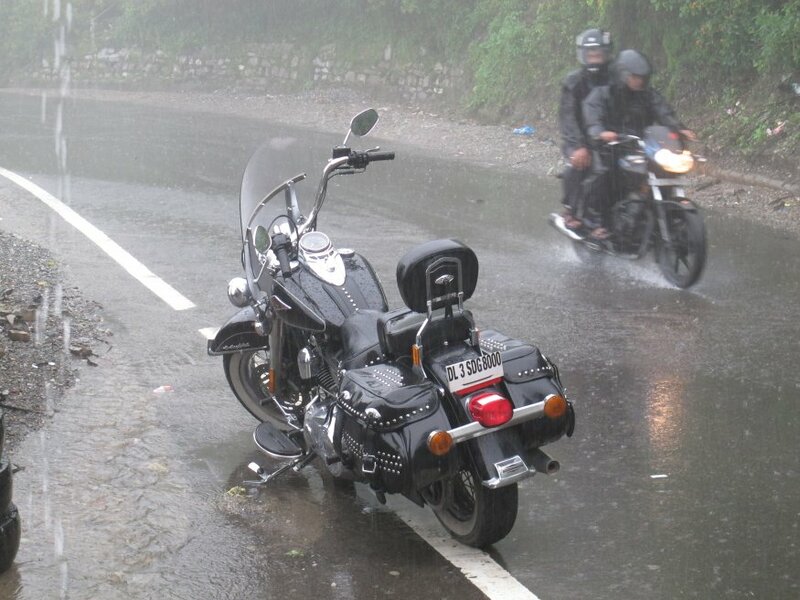 Especially when you are vulnerable, on two wheels and facing the monsoon’s fury in the Himalaya. dny wants to move the world on a cycle.